While there is a tendency to celebrate children and young people as creative subjects, there is also a tendency to deem them vulnerable targets of media industries. These contradictory characterizations have become even more pronounced with the advent of new digital technologies. “The discourse of the digital native has developed into a complex combination of hope and fear”(Takahashi, 2011, p.70). Working against the background of such dichotomous framings, my research question is simple: “Why do children and young people engage with media?” To understand the role of media in the everyday life of young people, I have developed the concept of ‘audience engagement’ as a heuristic device (Takahashi, 2009). 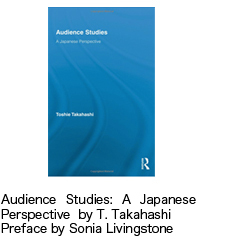 It encompasses the multiplicity of audience activities envisaged within active audience theories in both Western and Japanese media audience studies. The material for the essay is based on my on-going and long-term ethnographic research conducted on Japanese engagement with media and ICT in the Tokyo Metropolitan Area beginning in the year 2000. In order to test and re-contexualize the concepts and phenomena which I observed among Japanese youth, as well as to consider new developments, I conducted in-depth interviews as well as participant observation between 2010 and 2011 in the UK and US. Drawing on fieldwork done on young people and digital media in the US, UK, and Japan, I have investigated multi-dimensional audience engagement with mobile social media in terms of both the opportunities (connectivity, access, critical, tactics, collaboration, share and participation) and the risks (cyber bullying and defamation, infringement of privacy, hacking and stalking, over-dependency and addiction) of such engagement. In this essay, I will focus on one dimension of audience engagement – self-creation. “Self-actualization demands the careful negotiation between the opportunities (for identity, intimacy, sociality) and the risks (regarding privacy, misunderstanding, hostility) afforded by internet-mediated communication” (Livingstone, 2009, p.118). I will demonstrate how the processes of self-creation take place through a negotiation between the opportunities and the risks given by their engagement with mobile social media. This entry was posted in audience engagement, Facebook, impression management, Line, Mobile Media, self-actualization, self-creation, Social Media, Twitter, Youth and Media. Bookmark the permalink.